Microsoft kicked off E3’s conferences with a bang, leaving us hoping – and even expecting- the rest to follow suit. EA delivered. Unfortunately, what they delivered was the same tired press conference they do every year; dull and boring – showing nothing new or unexpected. What they did show of games that people really wanted was so vague and in early conceptual stages; mere teases than anything concrete. If you didn’t stay up for all of the conferences last night, don’t stress. You really didn’t miss all that much. EA started off on the right note, showing a bit of Star Wars: Battlefront. It’s a game that DICE says is the “Star Wars game it always wanted to make,” showcasing its design in a pre-filmed video. They showed a bit of the engine running, and it looked nice enough to get Star Wars fans excited – but it was such early, vague content that it may as well have remained unshown. After that EA’s CEO Andrew Wilson and his finely coiffed hair took to the stage to wax lyrical about putting gamers first. He showed a bit of Dragon Age: Inquisition (which does look great! ), in the same way that EA’s only been showing bits of Dragon Age Inquisition, then announced two new Bioware titles coming; one of which is a wholly new IP. A couple of bits of Mass Effect 4 concept art were shown, but like Star Wars, so early that they may as well have saved the information for next year. My biggest issue with it was that video they showed was just so unflinchingly pretentious. They also showed some – yes – concept environment art for the new Bioware game which has a bit of a post-apocalyptic slant. And then EA showed far, far too much of the Sims 4. I understand that the Sims is one of the company’s biggest selling franchises, but for the most part, the people who play The Sims and keep funnelling money in to EA’s coffers for desks, chairs, beds and all the other add-on content aren’t the sort who tune in to watch E3 press conferences. 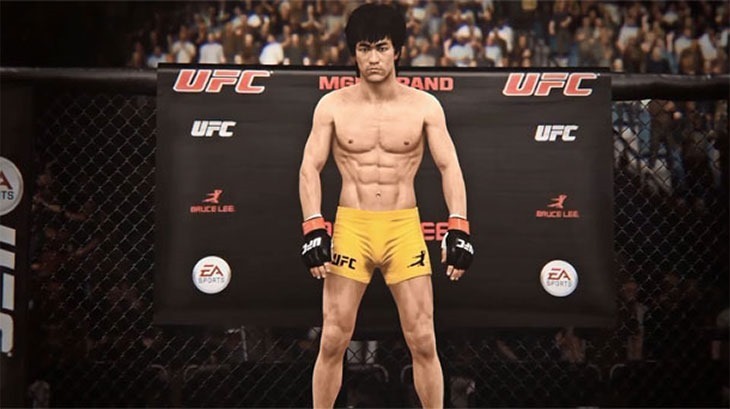 EA showed a bit of next week’s EA UFC and its digital Bruce Lee (sporting quite a digital banana in his hammock) and a bit of NHL 15, but both games have been previously announced, so weren’t particularly interesting. EA’s Patrick Soderlund then took to the stage to speak about Criterion Games’ up-coming new title, which eschews cars for just about every single other vehicle imaginable; helicopters, boats, jet skis, planes, motorbikes – all playable from a first person view, as if you died and were reincarnated as a GoPro helmet camera. One of the more bizarre things EA showed after that was a new PGA Golf, which they’re saying is Golf without limits. 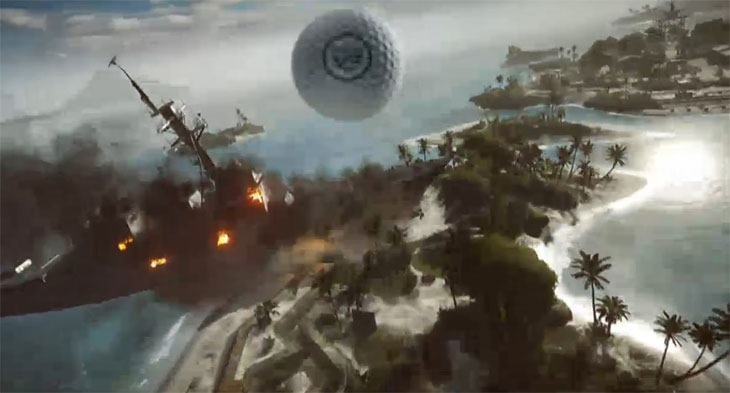 Or sense, it seems – as it’s essentially Putt-Putt on a giant scale, with battleships in the middle of courses, and other odd, misplaced obstructions that get in the way of actual golf. This is about the time I started wishing I was unalive, with EA showing its expected Madden 15 and FIFA 15 football games – along with some footage of it’s new MOBA Dawngate, which just screams as EA wanting a slice of the Dota and League of Legends pie. One of the games I was most eager for, the Mirror’s Edge reboot, was shown off briefly via another pre-recorded , pretentious video. The game is in an earlier state than hoped, and seems quite a way off unfortunately. 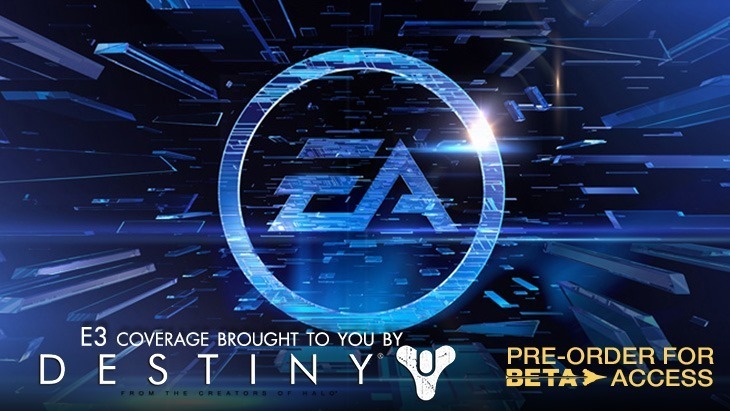 EA closed off with a whimper, as its big reveal was leaked quite a bit ahead of schedule. Battlefield Hardline, their new cops and robbers game closed the show. I love the premise of a multiplayer bit of cops and robbers, but on what planet is so much collateral damage okay for apprehending heist criminals? I very nearly expected the entire world within the game crumbling to nothing by the trailer’s end. I’d have preferred something a little more like Payday mixed with SWAT, than Battlefield with a skin. That was it. EA’s was undoubtedly the most boring, most scripted and most utterly predictable of the conferences, It was largely devoid of fun and the bits of new games we got to see were fleeting. You can watch the whole thing here, courtesy of IGN – but you’d be wasting about an hour of your life.